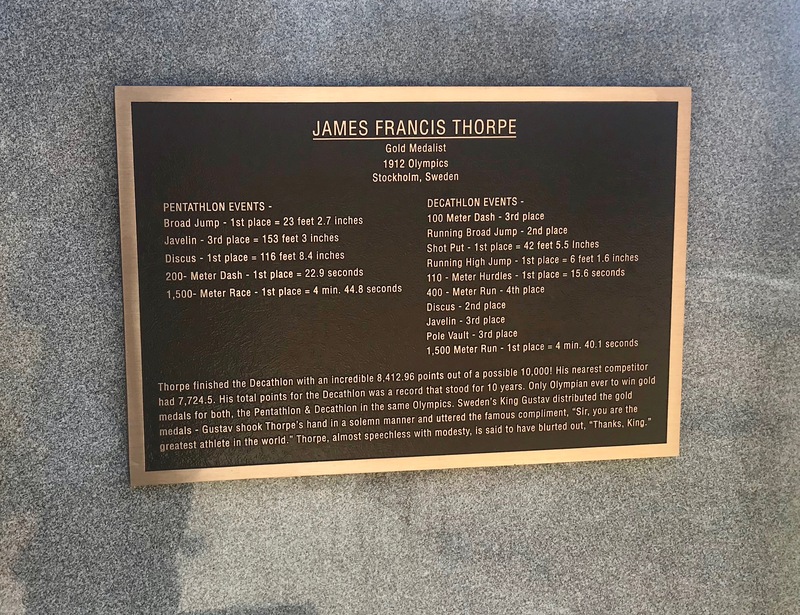 Thorpe was a collegiate All-American, NFL All-Pro & charter member of the Professional Football Hall of Fame, and played baseball with three different MLB teams. He also played for a traveling professional basketball team. 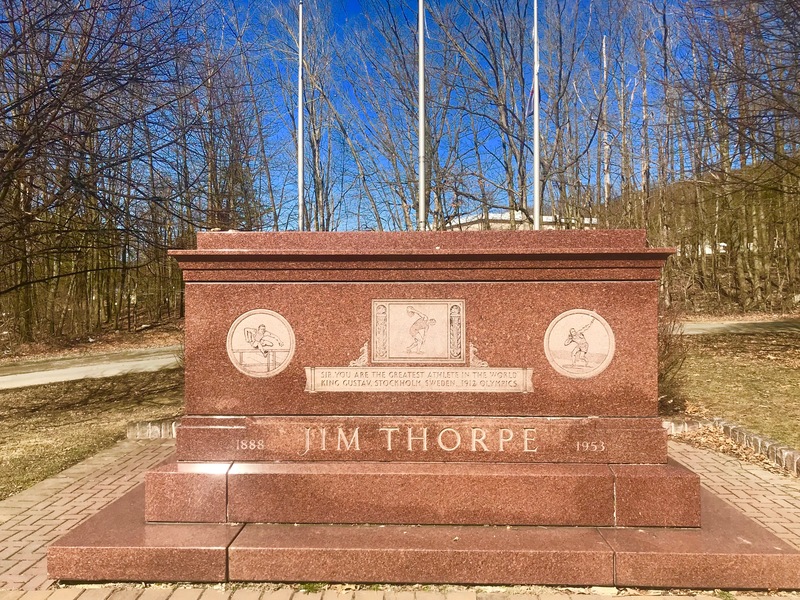 When in Pennsylvania for hockey, we traveled through Jim Thorpe, PA. Originally founded as Mauch Chunk, the community made a deal with Jim Thorpe’s widow in 1953. After Thorpe’s funeral in Shawnee, OK, city officials of Mauch Chunk bought his remains from his third wife, and Thorpe’s body was shipped to Pennsylvania without the rest of the family’s knowledge. I had mixed feelings about the monument to Thorpe in Penn. On one hand, the tribute, if a bit dated and weather-worn, was well done and seemed sincere. On the other hand, it was hard to get past the fact that Thorpe has become a road side attraction. Of all the turn-offs I’ve taken traveling, this one was as surreal as any. 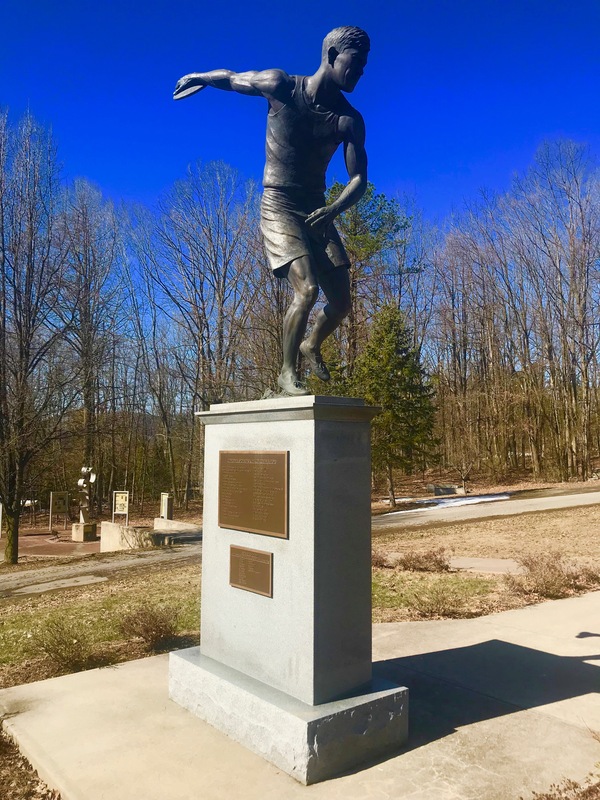 Upon receiving Thorpe’s body, the communities of Mauch Chunk and East Mauch Chunk merged and were renamed Jim Thorpe, Pennsylvania. 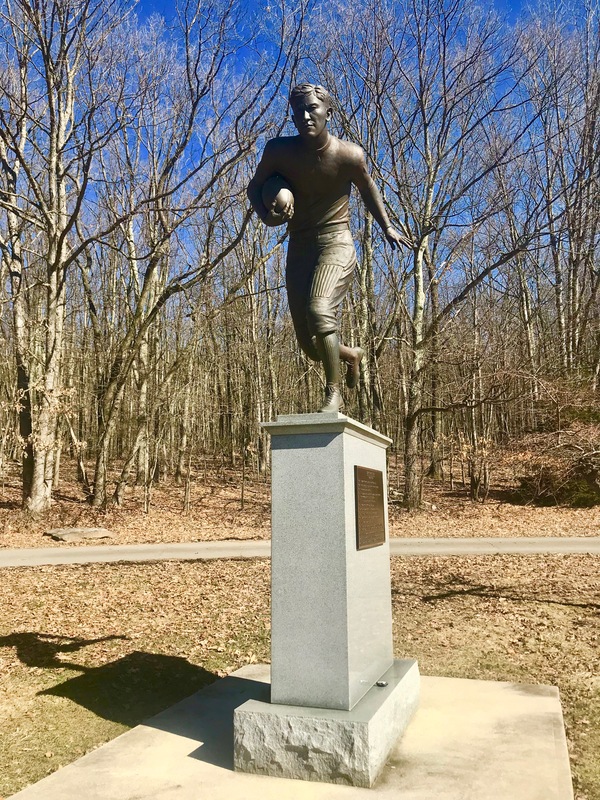 His tomb was built on a mound of dirt from his native Oklahoma and from the Stockholm Olympic Stadium, where he earned international fame. In 2010, son Jack Thorpe sued in Federal Court to have his father’s remains returned to Oklahoma. After several court rulings favoring both sides, the U.S. Supreme Court in 2015 refused to hear the case, effectively ending the suit and leaving Thorpe’s remains in Pennsylvania. Jack Thorpe died in 2011. The Soviets were the best team of that entire era, and arguably, by a large margin, but it would be a mistake to categorize the U.S. team as lacking talent. Of the 20 players suiting up for Team U.S.A., 13 would go on to play in the NHL, with three of those playing in over 1000 professional games: Neal Broten (1099); Mike Ramsey (1070); and Dave Christian (1009). At least five members of the Soviet team would also go on to play in the NHL. Team U.S.A. would meet Finland for the gold medal. 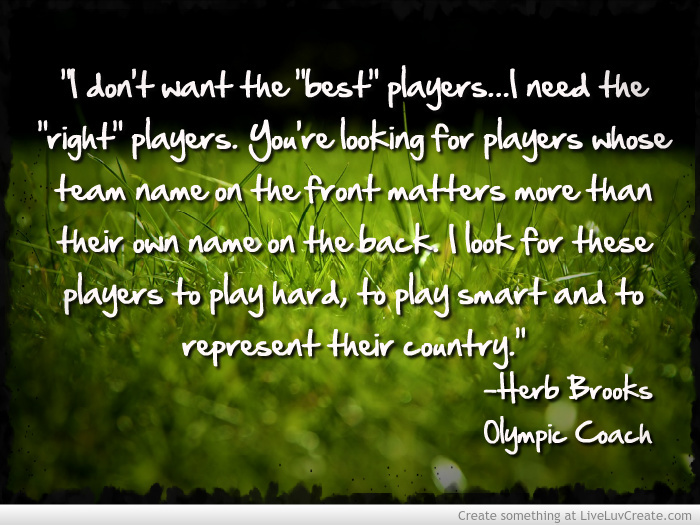 Without a win in the finals, the U.S. would not have medaled at all. The U.S. would beat Finland 4-2 for the gold. The Soviets would crush Sweden 9-2 for the silver. Surviving members of the 1980 Olympic hockey team were in Lake Placid this weekend to commemorate the victory 35 years ago. Two members of the team are no longer with us: coach Herb Brooks who died in 2003, and defenseman Bob Suter who died this past September. 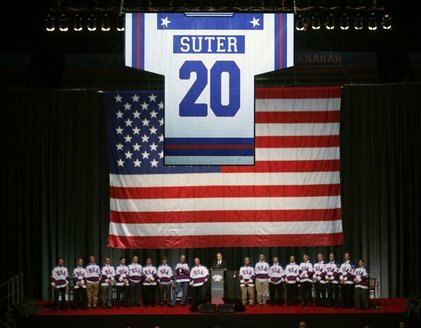 Suter’s jersey was raised to the roof of the Lake Placid ice rink, now named the Herb Brooks Arena, where it all happened.